March 09, 2016 / Holly R.
The weather is finally warming up and spring is in the air! There is no better time than now to stop by the Clearance Center at Belfort Furniture for great deals! 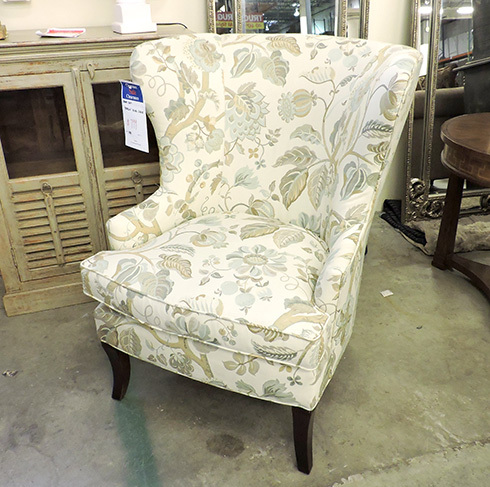 This week’s Warehouse Wednesday we wish to honor the beautiful spring weather with this gorgeous Hamlin Wing Chair. Accent your living space with this Hamlin Wing chair. Adorned with exposed wood feet, a contoured seat back creates a flowing design for comfortable relaxation. It is the perfect element for combining a new contemporary style with old traditional favorites. Accent chairs are a great finishing piece to any room, whether it’s a family room, living room, or a bedroom, they are versatile and will fit in any space of your home. The Hamlin chair comes in a fun floral pattern to brighten up the space. For an elegant yet comfortable seating option, look no further than this chair. Don’t forget to visit our Clearance Center to check out all of the amazing deals. Keep in mind, products are always changing in the warehouse so visit often!